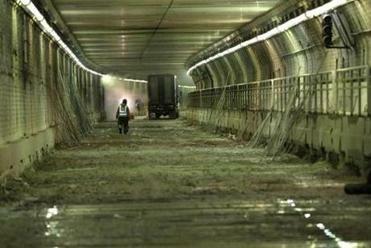 Just a few hundred feet from the bustle of Hanover Street in the North End, the tunnel that has carried millions of cars into East Boston since 1961 has been reduced to a runway of mud. Steel beams lie across its width like oversized railway ties. Rumbling machines chip away at the concrete, kicking up a dense fog. The Callahan Tunnel is undergoing radical surgery. “I think you can see why we couldn’t have cars in here,” said Frank DePaola, highway administrator for the Massachusetts Department of Transportation. In a tour of the construction site Tuesday afternoon, DePaola said work in the tunnel, which closed to traffic on Dec. 27, was running right on schedule. DePaola said he was pleased with his decision to opt for a complete shutdown of the tunnel — which has prompted detours affecting the region’s major roadways — rather than a partial closure that would have allowed a trickle of traffic but could have stretched the project over a number of years. State Highway Division administrator Frank DePaola said work on the Callahan Tunnel is on schedule. DePaola didn’t want to jinx it, but maybe, just maybe, he said, the Callahan Tunnel construction will finish even earlier than its anticipated March 12 reopening date. For now, he is crossing his fingers. “I’m pretty confident we’re not going to be late, that’s for sure,” he said, standing at the North End entrance to the tunnel. 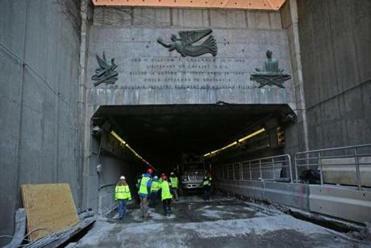 The $34.9 million project will rehabilitate the deck, curbs, gutters, and wall panels inside the mile-long tunnel that connects the North End to East Boston and Logan Airport. Inside the tunnel, crews have been working in alternating 12-hour shifts to conduct around-the-clock work. First, they scraped away the top layer of asphalt. Next, they must demolish the concrete foundation that carries the flooring, exposing the steel beams that stretch the width of the tunnel. But instead of using jackhammers to carve away the concrete, the crews are using high pressure water-jet concrete cutters — blasts of water that assault the pavement with 36,000 pounds of pressure per square inch, about 24 times stronger than an average pressure washer. It is more environmentally friendly, and construction crews have more exacting control over how deep they carve into the concrete, lest they nick the steel beams. The concrete cutters emitted a gray haze that looked like dust, but is actually water vapor evaporating into the chilly air. The concrete particles mix with the water to become a muddy sludge. The $34 million project will rehabilitate the Callahan Tunnel’s deck, curbs, and gutters. These past two weeks, as temperatures have plunged into single digits, construction staff were concerned the mud might freeze, making work more difficult. “As soon as we started, we thought it was going to be an ice rink in there,” said Scott Gorman, director of safety for McCourt Construction. But protected by the walls of the tunnel — and deeper inside, tons of surrounding ocean water — the temperatures inside have hovered at a comparatively balmy 30 to 40 degrees. Crews are preparing for the rest of the construction process: After the concrete is carved away, workers will install thin steel rods perpendicular to the foundation beams, forming a lattice throughout the roadway. After that will come the installation of new wall panels to cover the concrete walls, and prefabricated concrete curbs to serve as a buffer between traffic and the sides of the tunnel.Already, a set of those prefabricated curbs sits on a flatbed truck outside the tunnel’s entrance. Even in the midst of Tuesday’s bitter cold, DePaola looked unabashedly pleased, a smile on his face. Things are going so well, he said, that he believes MassDOT will be able to make similar repairs on the Sumner Tunnel, the Callahan’s twin thoroughfare, in the not-so-distant future. Not next winter, he said. But maybe the winter after. But, he insisted, he doesn’t want to jinx it.